Ouyporn Khuankaew of Chiang Mai is a gender and development specialist who has incorporated Buddhist philosophies of non-violence in her work. 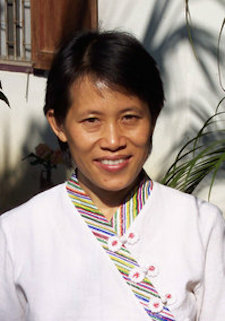 She has served on the advisory boards of numerous social change projects such as the Burma Relief Center, Shan Women’s Action Network, Earth Rights International, Women’s Education for Advancement & Empowerment, Women Peacemakers, Buddhist Peace Fellowship, Buddhist Think Sangha, and Non-Violence Global Peace Force. She has held consultancy and training positions with the Thai-German Technical Cooperation Program, Thai-German Highland Development Project, the United Nations, Thai Worldview International Foundation, Malaysian Institute of Cultural Affairs, and Wongsanit Ashram. She has conducted training programs on peacemaking, non-violent conflict resolution, democracy and politics, women’s rights, counseling women survivors of trauma, and community and team building. Ouyporn Khuankaew has lectured on Thai Women & Buddhism, Women’s Roles in Thai Social Movements, Feminism & Buddhism, Feminists Working Across Cultures, and The Impact of Globalization on Women. She has written widely and translated many feminist & Buddhists texts into Thai: What is Patriarchy?, Our Bodies Ourselves, Walking on Lotus Flowers, Mindful Meditation: A Handbook for the Buddhist Peacemaker, Buddhism & Domestic Violence, Thai Prostitution, and Higher Ordination for Thai Women. She is renowned in Thailand for having held the position of coordinator of the Women & Gender Program of the International Network of Engaged Buddhists. Currently, this dedicated feminist peace activist holds the distinguished position of Director of the International Women’s Partnership for Peace and Justice. People throughout south and southeast Asia have greatly benefited from her ocean-like compassion and wisdom.